The first open heart surgery in a teaching hospital in Nigeria has been successfully carried out at the University College Hospital, UCH, Ibadan, Oyo State. A statement by the institution’s Head of Information Unit, Mr. Toye Akinrinola, disclosed that the four-hour surgery was to correct a leaking heart valve in a 19-year-old secondary school leaver. An elated Chief Medical Director of the UCH, Professor Temitope Alonge, noted that the UCH was moved to embark on the exercise as a way of alleviating the hardship being experienced by Nigerians with heart-related challenges. He stated that as the first teaching hospital in Nigeria, the UCH should take the lead in critical areas of medicine, propelling it into ensuring that complex surgeries (like open heart surgery) were carried out in the hospital. feat: The surgical team that performed the feat at University College Hospital, UCH, Ibadan. “We are the pioneer teaching hospital in Nigeria, and we should be taking the lead. We are going to do this and we intend to make it a continuous exercise. Alonge, who lamented that Nigerians pay exorbitantly to undergo such procedures outside the country, pointing out that the cheapest rate outside Nigeria was about N2.5 million. Alonge stated that the Federal Government had given the UCH a mandate to improve on the training of doctors as a way of enhancing more access to adequate healthcare in Nigeria. Leader of the doctors from the USA, Dr. Kamar Adeleke noted that the patient would be back to his normal activities in less than two months. “He does not have anything to fear about life expectancy. He will soon resume his normal activities, and do all the things he was used to before he took ill,” Dr. Adeleke said. Adeleke gave assurance of his continued support to providing access to adequate healthcare as obtained in other developed countries. 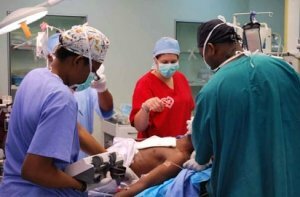 After more than a decade of of inactivity, open heart surgery resumed in the country at the University of Nigeria Teaching Hospital, UNTH, Enugu, at an average cost of N500, 000.